Ilyumzhinov was supported by the Russian Chess Federation, whereas Kasparov was running as a candidate from Croatia. Russia’s Kirsan Ilyumzhinov has been re-elected as president of the International Chess Federation (FIDE) for a new four-year term, the website of the Russian Chess Federation (RCF). The elections were held on Monday during the General Assembly of FIDE at the 2014 Chess Olympiad in the Norwegian city of Tromsø. The sole challenger to Ilyumzhinov in the FIDE presidential election was the 13th world chess champion Garry Kasparov. 110 people voted for 52-year-old Ilyumzhinov, who has held the post since 1995, while Kasparov received 61 votes. Ilyumzhinov was nominated for the presidency and supported by the Russian Chess Federation, whereas Kasparov, who makes no secret of his opposition to the current Russian government, was running as a candidate from Croatia. For several months prior to the election, the two parties exchanged accusations of violations of the rules of the game. Kasparov accused Ilyumzhinov of using FIDE for his pre-election trips and canvassing for votes, as well as of “co-operation with Russian oligarchs" close to Vladimir Putin. In response, allegations were hurled that Kasparov had promised large funds if he won to some individuals and companies in violation of the laws of several countries. 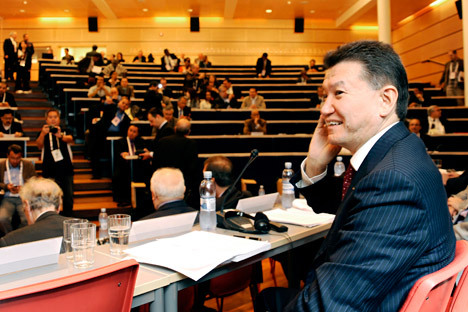 Kirsan Ilyumzhinov himself, when commenting on the election results in an interview with the Kommersant newspaper, pointed out that he preferred not to focus on political issues during his pre-election activities. “The big difference between me and my opponent is that he considers chess as a tool for politics while I consider the former to be outside of the latter,” Ilyumzhinov said. Based on articles first published by R-Sport and Kommersant.